Which Atari 2600 model is your favorite? Even though I owned a light sixer in the 80's, two 4 switchers and a Jr I still picked the Heavy Sixer. It just looks the classiest. It would also make a cool band name. I suppose their lead singer is a "heavy sixer" ie 600 pound whale. Gives new meaning to the phrase "it ain't over 'till the fat lady sings!" Edited by stardust4ever, Tue May 5, 2015 1:22 AM. Again, I ask! Is there anything beyond the Heavy Sixer that has the original color palette? As far as I know, the only way to get the original colors (seemingly more diverse than others) is with the Heavy Sixer!! My refurbed four switch looks very bright and vibrant to me on a CRT display with NTSC Channel 2. I replaced the regulator, filter cap, and swapped the original roached RCA cord with an internal 1 foot RG-6 Coax (with big ferrite choke block on it) terminating with an F-coupler mounted on the back panel for a VCR style RF out plug. No crappy switch boxes. It's the sharpest, cleanest RF output possible on an Atari system. Edited by stardust4ever, Thu May 7, 2015 4:39 PM. I like the look of the Sears models. The fake walnut, aluminum plate, and digital clock logo font put it over the rest. I knew the Fat Sixer was gonna walk away with this one. Such an iconic VCS console. It doesn't have a majority though. The poll really shows off the diversity of collectors. I mean the colors, themselves. There are different (arguably better) colors on the Heavy Sixer (and 6-switchers in general). The palette is different. This may be due to the 4050 buffer chip only found in 6-switch variants. Some feel that the colors on the later systems are dimmer and appear lessened to a degree. The original palette was changed after the first system. I actually program with the 4-Switcher and it's cohort clones in mind rather than the original as more people own and are familiar with the latter color scheme. The six switch models are sharper and have different colors! Here is what I'm yammering on about, just in case you thought I was crazy..
Well the camera recording the footage off the CRT screen probably over-saturated both models beyond belief. CCD based camera sensors never record the color properly. It is a 3 lens projector TV, so it was mainly to identify the color differences. The camera doesn't like to focus and has a hayday with the brightness of the colors, yeah. It looks so much better in real life. These comparisons were taken one after the other with the same TV under the same conditions. Edited by Papa, Sat May 9, 2015 5:21 PM. The game looks different being played on the Heavy Sixer than it does on the 4-switch. Everything else remains the same: lighting in the room, approximate time of day, television...the only difference is on which system the game is being played. I was trying to find more information or comparisons like the one you made, Papa, but haven't yet found any. This would be good to explore more. You or someone could try a direct video capture from the RF feed of an unmodded system. System needs stock RF because too many variances between the assortment of composite/S-video mods out there. A VCR could be used to demodulate if the capture card does not support RF tuner. Bear in mind the older the capture hardware, the more likely it is to not have issues with the off-spec signal. Neither of my systems are modded in any way. I'm pretty sure they've never even been recapped or anything. I've done this comparison on other TV's, too. The color palette of the six switch system is different than on a four switch. It's always been this way! I could hook them up (both of mine are fed through VCR/DVD combos RF and then into the projector TV.) to an HDTV to avoid brightness or saturation issues, although the difference really isn't that big. This wouldn't change the colors themselves. I've noticed that there is a bit of a staleness to the four switch systems when compared to the six switch. 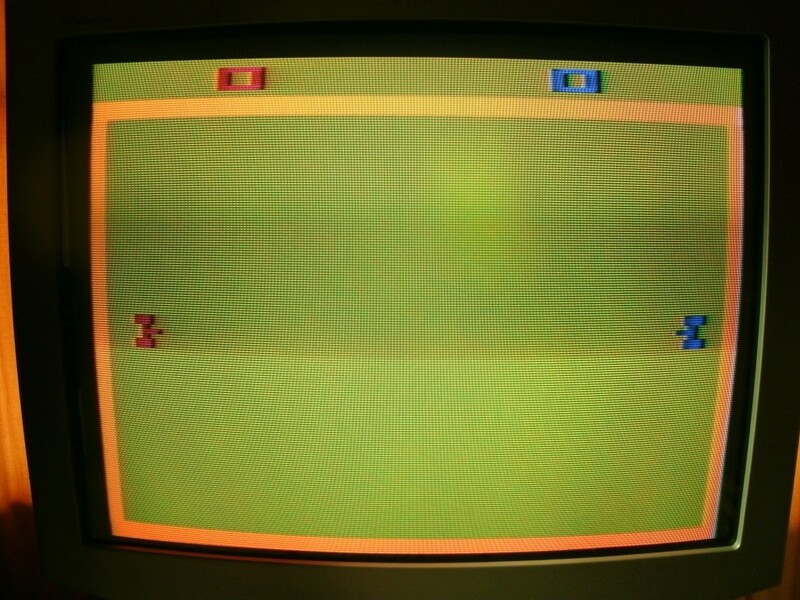 For instance, in Pacman the character looks darker yellow and seems more solid. I've compared the six switch system to several others and found that the original color palette is only found on the six switch system! I used to have a Colecovision with a converter and an Intellivision with their converter but didn't have a six switch at the time to make comparisons. Now I have a Gemini, a 7800, a 4-Switch system, a Flashback 2, and several emulators. The Six switch system has the original color palette. I'm not making this up and it's not my TV. I would have guessed the H6 because of its better stock RF picture, followed by the Light 6er due to having all the switches 'in the same place', then the Junior for portability. the website www.2600connection.com had this to say about the original..
"In our experience, the 6-switch models offer a superior picture output, compared to the 4-switch and JR models. Coupled with a coax-to-phono connector, they offer a picture quality that's comparable to any mod, and you can obtain composite A/V output if used in conjunction with a VCR." I was also wondering.. If the 4050 didn't do anything, why was it added to the Jr. version when the 4-switch models didn't have one? Which of these models Atari manufactured the most of? From my memories it seemed it was the 4 Switch wood vaneer. It was so common thats proably the reason why its not getting a lot of votes. Edited by WildBillTX, Fri May 15, 2015 1:44 PM. Reviving this topic, but I got to go with the Vader. Best of both worlds visually. Classic design in a sleek all black casing; perfect look for the early 80's. I also love the Junior for it's small size. Fits great snugged next to a TV. Another possibility is the color-delay adjustment on the 2600. I use the 2 copies of the same game and between them to make each have the correct color. Just one small wrong adjustment can really make it look different! I'm never one for butting components up against each other with no room for play and flex with temperature changes. I prefer a mm or 2 of separation and something of an S-bend in the wires when practical. To remove the "flimsiness" just secure it with an RTV silicon compound without acetic acid. The colors are vibrant / well-saturated on all of my six-switch models (1 heavy, 3 light), so it isn't just the earliest ones that have good colors. These colors at nearly spot-on. Maybe at most 4 degrees off. But I've never really seen a vader or 4-switch that far out of adjustment coming from the factory. Edited by Keatah, Sun Oct 25, 2015 8:35 PM. Well, like I said, I have two rev. 12, 4-switch woodgrain 2600s, and the colors looked exactly the same on both of them before adding the resistor and after. I think the most likely scenario is that they came from the factory that way, because the idea that they both drifted out of adjustment by exactly the same amount, or that two different previous owners both happened to misadjust them by exactly the same amount, are both unlikely. Plus, they weren't technically out of adjustment, but rather, they were missing a component; i.e., adding the resistor transformed that aqua color to green in both of them. Maybe early on in the 4-switch production they were leaving the hue pots set the same as on a 6-switch, and then later on they started compensating for the incomplete circuitry by adjusting the hue pot differently, until finally doing it right by including the resistor in rev. 16 motherboards and higher. I believe that rev. 12 is the earliest version of the 4-switch motherboard. One of the two that I have has hybrid between a 6-switch and 4-switch bottom half, which suggests it is a very early one. Butting components together? What about PCBs with components soldered on? SMT or through hole with clipped leads, everything is literally "butted together" (even with wildly varying expansion coefficients) but nothing ever breaks. Except Xbox 360s with ROHS compliant solder. Lead free suxx.